Stem cells and cancer cells have enough molecular similarities that the former can be used to trigger immunity against the latter. 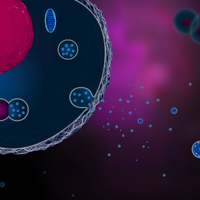 ISTOCK, NOPPARITWith their pluripotency and ability to self-renew, some cancer cells have been likened to stem cells. 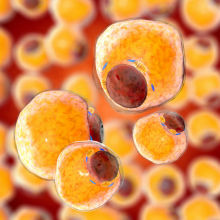 Now, researchers show that the similarities between the cells are in fact sufficient for induced pluripotent stem cells (iPSCs) to serve as anti-cancer vaccines in mice. A paper in Cell Stem Cell today (February 15) reports that injections of irradiated iPSCs protect mice from developing breast, lung, and skin cancers, and prevent surgically removed cancers from regrowing. While control animals developed sizable tumors over the weeks following cancer cell injection, mice that received the vaccine tended to have smaller tumors, or tumors that regressed. The use of iPSCs circumvents these issues, says Kooreman, a coauthor of the study. The ultimate goal, he says, would be to isolate blood or skin cells from a patient, create iPSCs, irradiate the cells so they themselves cannot form tumors, and then inject them back into a patient already suffering from cancer. Or, says Stanford University’s Joseph Wu, who led the research, the iPSCs could be used as a prophylactic in older people to protect against the possibility of developing cancers. 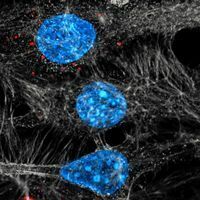 “By the time we reach 70 there’s a higher prevalence of cancer, so it’s possible in the future that anybody who is 70 years old will have iPSCs generated and be vaccinated to prevent future cancer formation,” Wu says. To find out if such concepts might actually work, the researchers turned to mice. Having first determined that mouse and human iPSCs have gene-expression profiles similar to those of cancer cells, the researchers used mouse iPSCs developed from fibroblasts together with an immune-boosting molecule called CpG to vaccinate the animals. A few weeks later, the mice were injected with breast, skin, or lung cancer cells. While control animals developed sizable tumors over the weeks following cancer cell injection, mice that received the vaccine tended to have smaller tumors, or tumors that regressed, showing that the vaccine worked prophylactically. To confirm that the vaccine conferred specific anti-cancer immunity, the team transferred T cells from vaccinated animals into non-vaccinated animals with breast cancer, and they too experienced tumor regression. Lastly, the team showed that while the vaccine could not eliminate established skin cancers in mice, it could prevent the regrowth of tumors that had been partially removed by surgery. “That was a really exciting finding . . . because it is a realistic setting,” says Overwijk. Often, surgeries to remove tumors from patients are unable to eradicate all cancerous cells, he explains. So a follow-up iPSC vaccination to boost the patient’s own anti-cancer response would be highly valuable. Whether the vaccine will show similar efficacy and safety in humans remains to be determined, but these animal studies provide “a solid basis from which to go forward with real clinical potential,” Overwijk says. N.G. Kooreman et al., “Autologous iPSC-based vaccines elicit anti-tumor responses in vivo,” Cell Stem Cell, doi:10.1016/j.stem.2018.01.016, 2018.